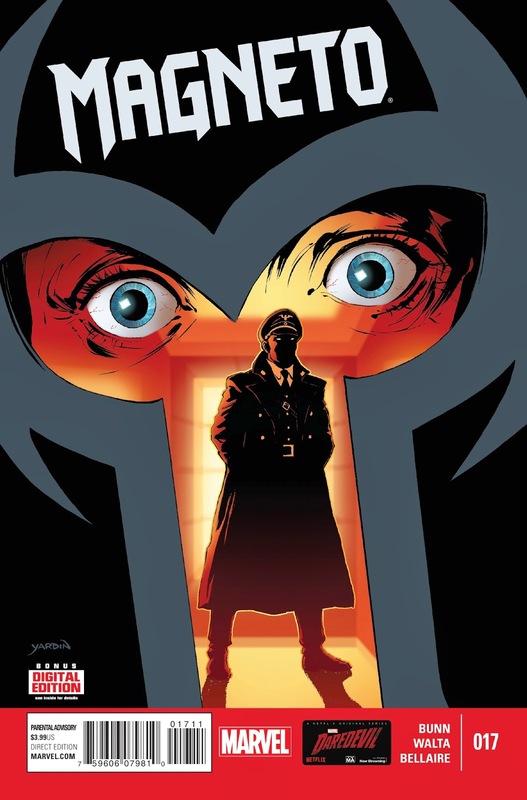 Magneto is an introspective exploration of a complex character that is a must-read. This is some of the finest work coming out of Marvel and is the culmination of a lot of work from the creative team on the series. This issue is so dark and gritty, the artwork so tense, and the coloring so moody that it takes more than one pass reading it to fully comprehend what a great comic this is. It almost seems a shame that the flow of this series will be cut short by "Secret Wars," but thank goodness we get to see more under the "Last Days" banner of the Marvel-wide event. 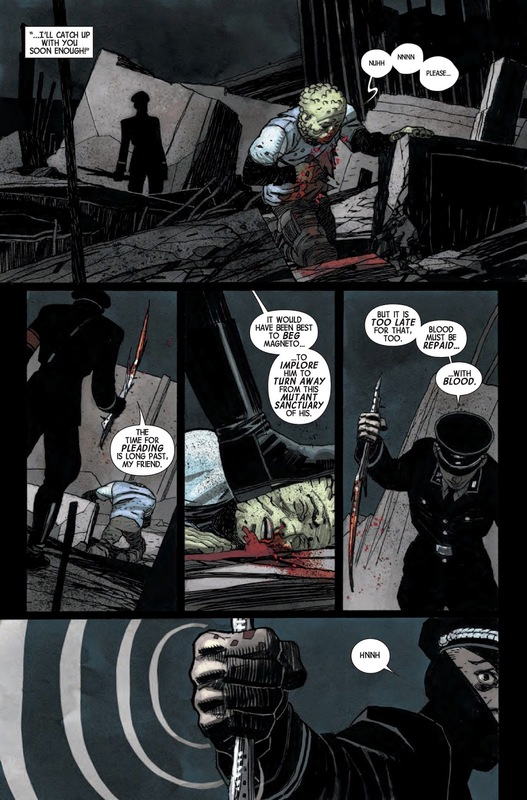 The strands that writer Cullen Bunn has unraveled throughout the series become apparent and are rolled back together in issue #17 of Magneto. In hindsight, Bunn is showing some keen mastery of the subplot context, laying out aspects of the character of Magneto that can be exploded for readers here. It is the subtly of this skill that is so very clever. Bunn's work is now paying off as we glimpse the shadowy figure that has been haunting Magneto in recent issues. Having reviewed the more recent offering of solo X-Men series that have been produced by Marvel, this stands out as the best of the lot. Whereas Storm certainly stands on its own and is a definitive version of the character, Cyclops was a hit and miss, and Nightcrawler had its fun moments but was lackluster, for Magneto the right creative team came together at the right time to produce a fantastic comic. This editorial team needs to be acknowledged for helping bring it all together. 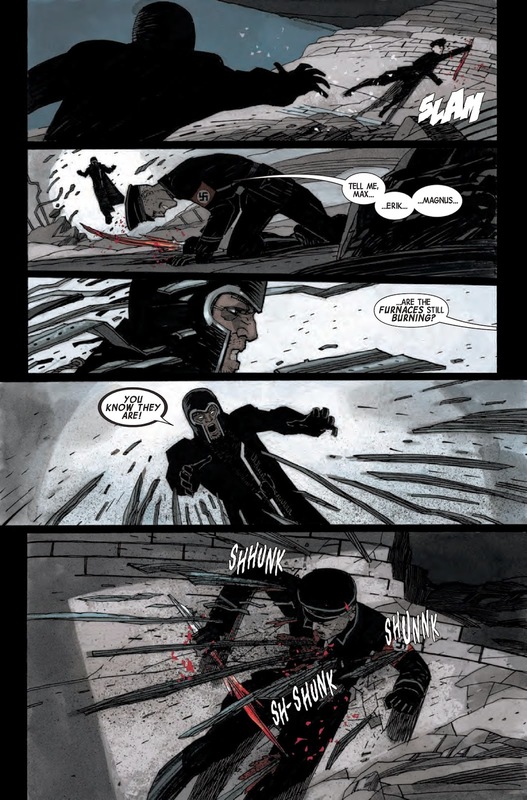 As far as this story goes, without spoiling it, we get a glimpse of the nature of who Magneto is—a multifaceted character imbued with a history and back story that other characters in the Marvel Universe would be either envious of or squeamish at. It is the malleable nature of his character that drives this series in unexpected ways, providing some tantalizing plot twists and dramatic situations. As always, the art is just fantastic. The consistent quality is a high mark for the creative team; they are a match made in comic book heaven, with Gabriel Hernandez Walta on pencils and Jordie Bellaire on colors. Couple this with the cover art work by David Yardin, and it is enough to produce a nerdgasm. 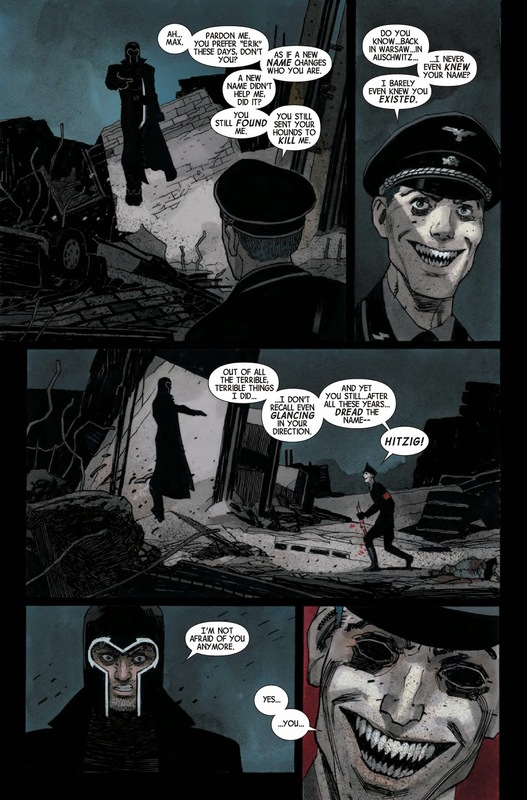 The voice of the Magneto character is as much a result of Bunn's work as it is the artists involved in this issue and series. The careful consideration given as to how to depict Magneto has played out well in this issue. We see the balance of necessary decisions the character has had to make, whether for good or bad, come to the fore and take expression in his figure and face. Can the Master of Magnetism defeat his past? If you aren't yet reading this series, seriously go get the trades when they come out (the first two should already be available in good stores now) and take in the great story offered by this series. I am really anticipating something big in next issue; the tie in to "Secret Wars" is coming just in time to maximize the serious questions Magneto has been asking of himself and his legacy. So, comic fans, what did you think about this issue? What did you think of Bunn's ending? Did it blow you away? Tell us below or head over to the Fanboys Anonymous Facebook or Twitter and leave a comment. Make sure you come back for the continuation of Magneto in the "Last Days" as we head into "Secret Wars."